Need a Girlfriend? Cloud Girlfriend Is the Answer! Calling all the Howard Wolowitzes ((The Big Bang Theory)) and Morgan Grimeses ((Chuck)) of the world. 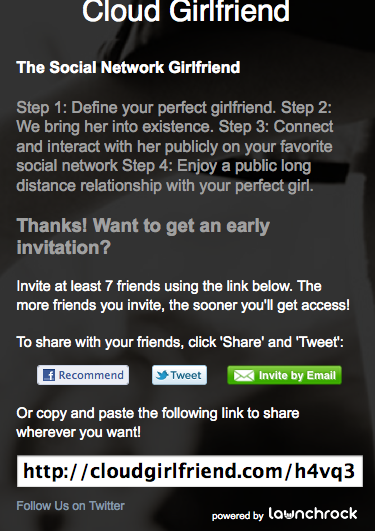 A new web site is launching soon, and it promises all the lonely men of Facebook all the benefits of a virtual girlfriend. Dubbed Cloud Girlfriend – The Social Network Girlfriend, this site just might be the answer to the prayers of those men who have been desperately wanting to change their status to “In a relationship with —” on Facebook. So how does it work? From what can be seen on the site, there are only four steps to the perfect relationship. The site will bring her into existence. Connect and interact with your perfect girlfriend (who has been brought into existence by the guys at Cloud Girlfriend) on Facebook, or whatever your preferred social network may be. Enjoy a public long distance relationship with your girlfriend. I kid you not – take a close look at the screen shot below or simply visit Cloud Girlfriend. You won’t be able to do anything on the site except to sign up for when they launch. ((Yes, I did sign up to see if it will work.)) And when you do sign up, you get this message. Do you think that this site will gain traction once launched? More importantly, do you think it will last? Personally, I am wondering if it can be an alternative to playing The Dating Game on Facebook. Oh, and why is it only about girlfriends and not boyfriends??? I started a site with this same concept almost a year ago and it’s been fully operational for a few months now at http://www.MyCyberGirlfriend.com . Their idea seems similar to what I have done.